Kid Friendly? - Neutral. It's edible, but very spicy. This is not a Sonoran Desert native but a naturalized weed that originated in Europe. You'll start to see this sucker everywhere once you start looking. I was first turned on to this by a young man from Ironweed Tree Experience during an afternoon activity. 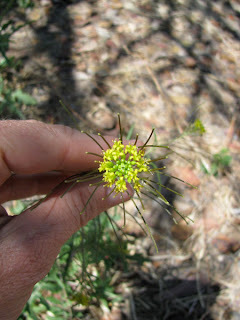 We were in an arroyo and he pointed out the plant along some shady areas. You can imagine how surprised I was when I went home and discovered that this was growing as a weed all over my yard. I found the most concentration among rocks underneath my mesquite tree, hiding out in the partial shade. The leaves (the younger, the better), seeds, and flowers are all edible, although I've also read on just one site that too much can be bad for you. However, it is really spicy, so I don't believe overeating would ever be an issue! To be honest, I don't know that I would even add it to a salad, it's so spicy. In my opinion, it would go better with a stir fry or a soup, for a little zing. EDIT 4/19/13 - While perusing honest-food.net, I came across some information about the pungent bite to these mustard greens! According to Hank Shaw, who is both a hunter and forager, this bitter/spicy bite to the wild mustards only develops once the temperatures are in the 80's. The flavor is not as intense if it's picked when the temperatures are still in the 60's and 70's. We had a major heat wave very early this year, so I never got a chance to try these before it was in the 80's. I'm looking forward to next year! The following are pictures I took in the third week of March. 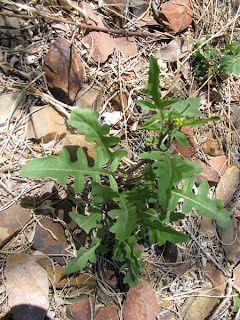 These weeds were noticeable in early March, and you can see that the seeds are already forming. I understand that they can bloom in the fall, as well, so we'll see if they die off in the summer and reappear, or if they simply bloom twice a year. It's been lovely to have this edible plant show up in the yard without any effort on my part - my kind of gardening. If you, too, are hoping to look for it, I would make certain of the plant before you try it, as one usually does with new plants. I am not certain if there are any poisonous plants that look similar, although I haven't heard of any. 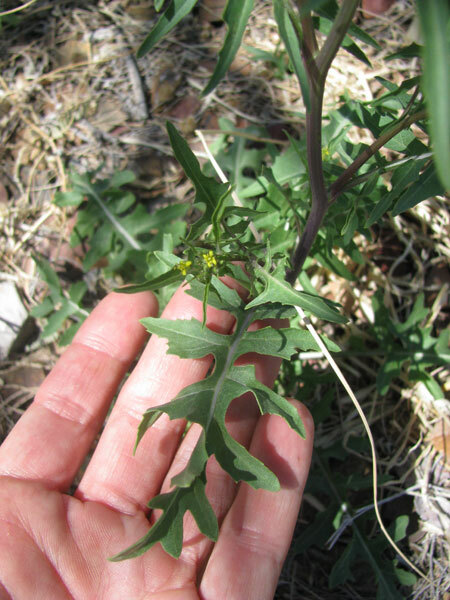 To help figure out if this is the plant you want, the Rocket Mustard has no thorns, no fuzziness, and once you try it, the taste is memorable. When it's chewed up, it has a slightly 'green' flavor and then the mustard-like bite hits hot and strong. For more information on this awesome little plant, take a look here.